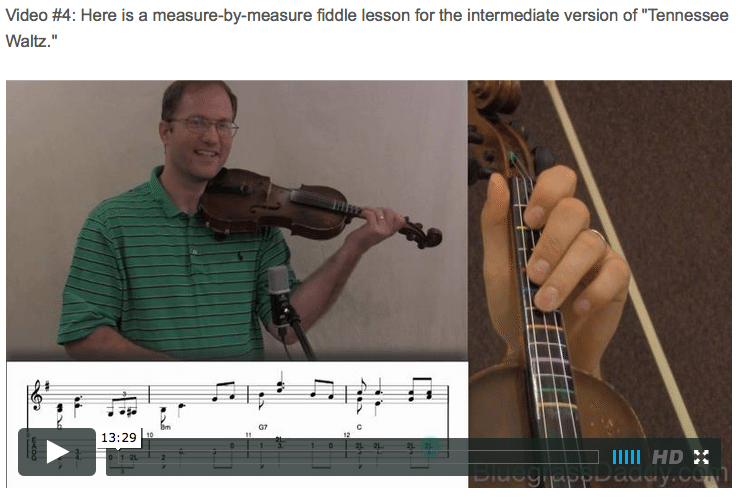 This is an online fiddle lesson for the country tune "Tennessee Waltz." 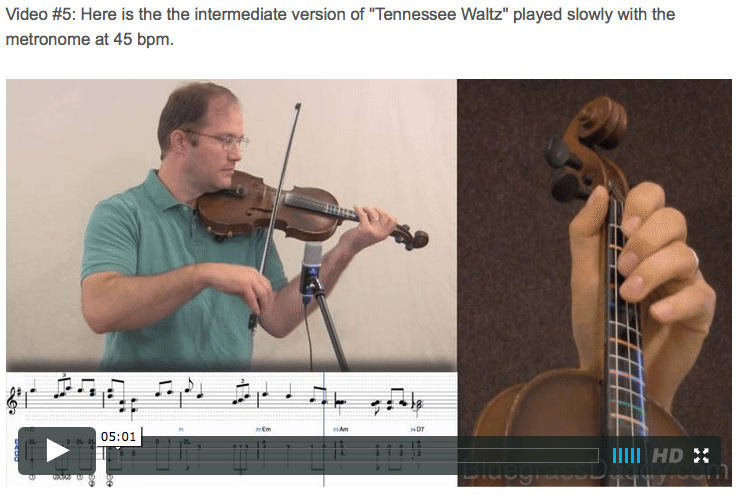 Video #1: Here is a video of me playing the country tune "Tennessee Waltz in the key of G."
Video #2: Here is a video of me playing the country tune "Tennessee Waltz in the key of A." 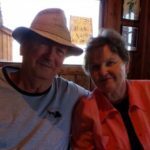 " that site visit this site right here Tennessee Waltz" is a popular/country music song with lyrics by Redd Stewart and music by Pee Wee King written in 1946 and first released in December 1947 as a single by Cowboy Copas that same year. The song became a multimillion seller via a 1950 recording – as "The Tennessee Waltz" – by Patti Page. As of 1974, it was the biggest selling song ever in Japan. Pee Wee King, and most of his group, the Golden West Cowboys, were riding in a limousine in 1946 when he and vocalist Redd Stewart co-wrote the song. They were on their way to a Grand Ole Opry appearance in Nashville when they heard Bill Monroe's new "Kentucky Waltz" on the radio. Stewart began writing the lyrics on a matchbox while King and the other musicians hummed King's theme song, "No Name Waltz." King and Stewart presented "Tennessee Waltz" to music publisher Fred Rose the next day, and Rose adjusted one line of Stewart's lyric: "O the Tennessee waltz, O the Tennessee Waltz," to "I remember the night and the Tennessee Waltz." A considerable amount of time passed before Pee Wee King's Golden West Cowboys were able to record "Tennessee Waltz," their recording being made in a December 2, 1947 session at the RCA Victor Studio in Chicago. Cowboy Copas, who had formerly vocalized on the Golden West Cowboys' recordings and who still performed with the group, recorded the song for King Records just after the Golden West Cowboys, with Copas' version being released just prior to the Golden West Cowboys': both singles became Top Ten C&W hits – the chart was then known as "Best Selling Folk Retail Records" – in the spring and summer of 1948 with respective peaks of #3 (Pee Wee King's Golden West Cowboys) and #6 (Cowboy Copas). This topic contains 27 replies, has 12 voices, and was last updated by John Cockman 1 year ago. 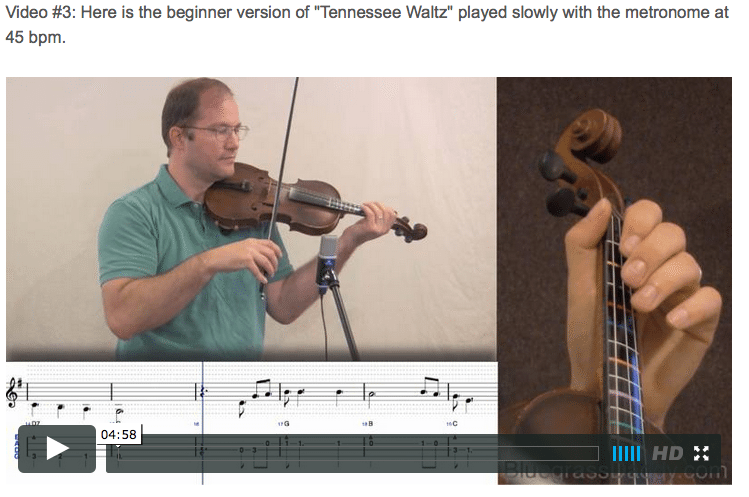 This is a much-requested twin fiddle tune called the “Tennessee Waltz.” The lesson is in G for beginner and intermediate. Also included is tablature for harmony in the keys of G and D. Fiddle with a friend. That was great, very very nice lesson. Thank you! Thanks for all the options on this, John! It’s nice to have two keys and harmony for both of them. 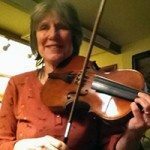 I now have another fiddle buddy and we will enjoy playing this song. Thanks, Gu, for letting me know about the copy/paste error. Justine, that is great that you have a fiddler to twin with! This is a great tune for it. I twinned on this song with Rebecca Barker at Fiddlers Grove this weekend. I wish I had a video of it! I have the lesson in the keys of G and D, but if you need another to sing/play in a different key just let me know. It is not too difficult to transpose the sheet music and jam tracks. Thanks for your kind offer, John! Most likely the two keys provided will be enough for us! Thank you for making such a fine video, John. I tried downloading the tabs but I kept getting re-directed to the new membership section. I was logged in and tried to access the tabs on the lessons page through two different browsers that I have used to download successfully at other times. I experimented by trying to download tabs from other lessons on the lessons page and they downloaded okay. 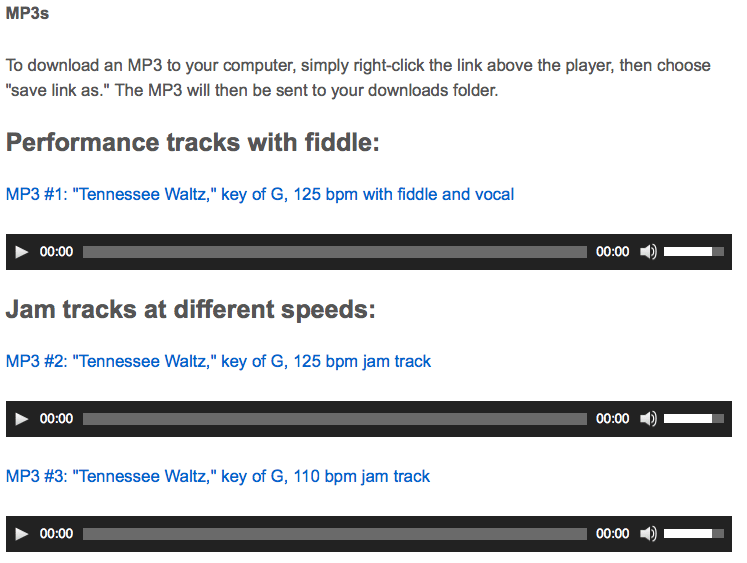 Is there anything you can suggest to help me in downloading the tabs and notation for Tennessee Waltz? Glad you asked that, Scott. I’m having the same problem! It’s fixed now! I thought it was a copy-paste error before, but actually I accidentally reverted to a previously saved draft. Somehow. 🙂 Let me know if any other links are down on this lesson! Any problems and I will let you know. thanks John, My friends play this song in G. so this posting of the Tennessee Waltz is very helpful. Thanks Great Scott! Safe travels into the uncharted regions. 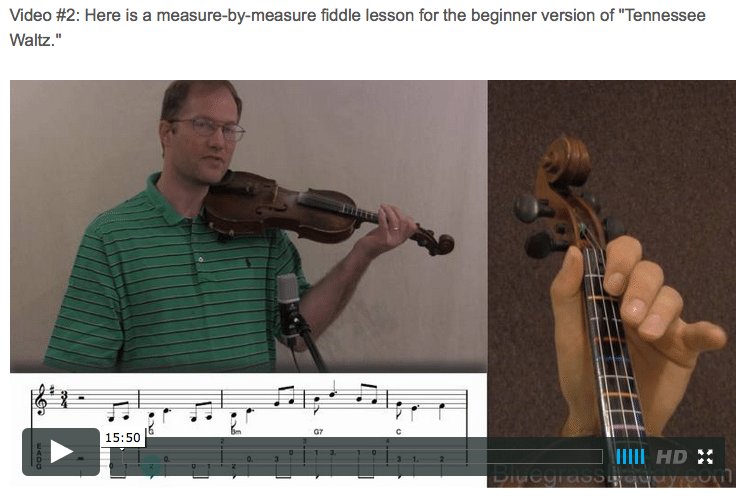 FiddleBill, I hope this lesson helps! You are welcome! Thanks for saying “thank you!” Hope to hear you play it in the Lion’s Den soon. I recall hearing this piece when it was just introduced on the radio ( KROX Crookston, Minn.) back in late 40’s or very early 50’s. Lovely song but wondered if there wasn’t a better way of choosing friends. Am taking a stab at learning it but that list is growing but skills follow v-e-r-y slowly. Appreciate hearing about who composed it and when it was written and wasn’t aware of that. Recall all those dudes from back then too. Good luck! Hope to hear it when you are finished. I’ve just started learning the intermediate version. I really love this tune! 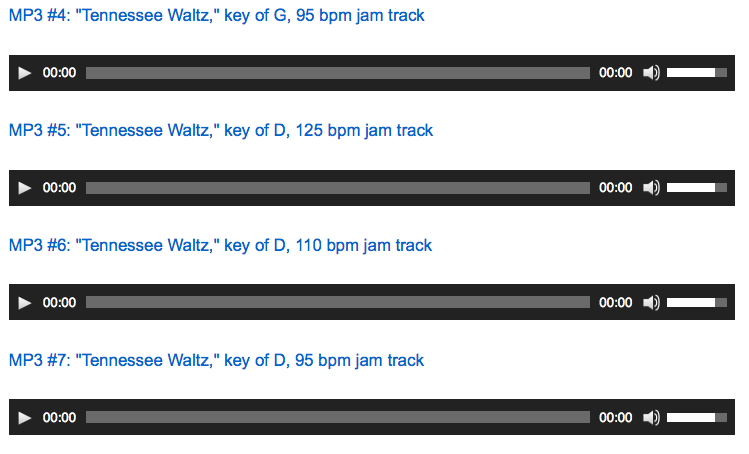 Which key did PeeWee King play/sing in? Pee Wee King recorded the song in Bb, but preferred to perform it in Ab. B flat and A flat???? Good grief…I need to have a looooong talk with that boy! Haha I know. What a jam buster that would be! “OK everyone, capo-one! Were going to play some Tennessee Waltz. Good luck, Mr. Bass Man! I am slowly learning this one too. Started last Friday night. I love the ability to learn it one section at a time. It helps. I started learning it on Friday night as well. It’s super fun to play! I don’t think I’ll be emulating Peewee King in this instance though- Bb indeed! Just attempted the intermediate 1st line and almost had the dog race out of the house. Absolutely love this waltz and want to perfect it so will add this line to my practice every day and increase a measure or two when I get it to be listenable. These waltzes that you’ve provide are really some of my favorite sounds in music, I think. Great fun to learn too! I’m glad you’re enjoying this one! It’s a great tune. I need to try to learn this one. Hello! We (me acting for my 12 year old daughter) have just signed up for your lessons today and this is what she picked to do first. She is very excited and has already learned the first 2 intermediate lines. Thank you for providing this great information! Hello and welcome! Hope to hear her in the “Lion’s Den” forum soon!